This project was created on 01/20/2019 and last updated 3 months ago. 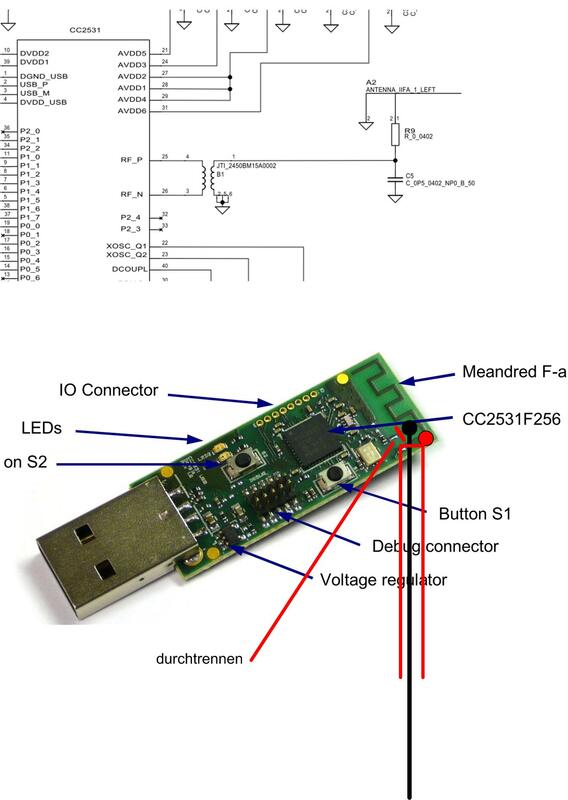 This is a simple yet very effective hack to increase the range of your CC2531 USB ZigBee adapter. Since there are a couple of people doing it wrong or at least not really effective I show you how to add an SMA antenna socket the right way in terms of keeping your impedance at 50 Ohms. ZigBee aka IEEE 802.15.4 is pretty nice but range is somewhat limited due to the fact that it shares the same 2.4GHz band as WiFi and many other modern gadgets. Especially if you have a larger apartment, house or garden, you probably want to extend the range of your smart home gateway. Also, your generic cc2531 Adapter has way less output power of approx. 14dBm / 25mW compared to your common WiFi network with up to 100mW. To make it even worse, the PCB antenna is an additional bottleneck for these signals. So, besides using different channels for WiFi and Zigbee it is desired to utilize this little energy as efficient as possible. Adding an external antenna improves both - reception and transmission of your signal. Of course just adding a length of random wire might help a bit, but the correct way is to maintain line impedance of 50ohms so you can connect a matching external antenna for 2.4GHz. Fortunatelly, the spacing of the PCB antenna just matches the dimensions of readily available PCB-mount SMA sockets. I have used these SMA sockets from AliExpress for around 0.17 US$ per piece. If you prefer, you can use such RP-SMA sockets of course as well. Just make sure your antenna has the right connector. Make sure to buy/use the same of a kind! That is, either SMA socket and SMA antenna or RP-SMA socket and an antenna with a RP-SMA connector. Using just a sharp knife or dremel, you have to cut and remove two small parts of the the traces as visible on the photo. Then you can solder the adapter to the board. To improve the ground connection of your socket, it is reasonable to also connect the now defunct rest of the antenna trace to ground. This gives proper grounding to your socket from both sides. Adding just a little bit of superglue to the socket on the back of your board not only helps you keep the socket in place while you solder it but also gives additional stability. Just cut / remove the pcb as visible on the photo. Also note that I&apos;ve removed a little bit of soldermask on the end of the pcb antenna and the groundplane close to it. Don&apos;t forget to solder the ground trace/bridge on the left side. Put a phone light/torch behind the old antenna and I believe you will see that there&apos;s a bridge to ground in a lower layer of the PCB - triangular shape object. This looks to go to the visible trace closest to the corner where the new connector fits. That might explain the results @MikeCC and @data found? 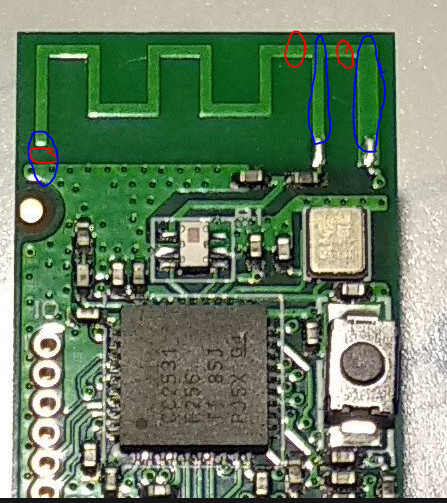 It would be interesting to test without the edge ground pin on the SMA connector soldered to the trace as then I don&apos;t think the connection will be made. @data does it make a big difference? I have cut / removed the pcb at the two points as visible on the photo. Then I checked if there is still a connection between ground and the point where I have to connect the antenna. Surprisingly there is still a connection between ground an antenna connector although I cut the pcb at the two points. This is not correct, right? Is there any other point I have to cut/remove? I just checked with one of my adapters with a multimeter, and there is indeed still a connection to ground. Since I don&apos;t have the schematics at hand at the moment, I can&apos;t tell why it is there. Maybe it is due to some rf-frontend protection circuit which shorts unwanted voltages to ground. However, the antenna works, at least according to the improved signal I get. With my multimeter I measure 0 Ohm resistance between antenna connector and ground. So this means that it doesn&apos;t make any sense to cut the two points from pcb, right? I just checked the schematics: the measured connection between the antenna output and ground is fine, since it is connected via R9 (0 Ohm) and B1 (rf-coupler) to ground. What do you mean with &apos;it doesn&apos;t make any sense to cut the two points&apos;? Since you&apos;ve asked this question, I guess you have no idea of high-frequency/RF signals. The RF-Frontend of your stick consists of R9, C5 and B1. Simply said, this frontend is designed and built in such a way, that DC voltage and all unwanted signals (other frequencies than 2.4GHz) are shorted to ground so that only the 2.4GHz frequency signal is fed into the chipset. How you do it shouldn&apos;t make much difference. But it is probably easier to just bridge the small gap with some solder. Actually, the best would be to keep the ground connection as short as possible and make a short bridge to the resistor next to the ground-leg. However, the risk that you accidentally remove/displace the resistor is too big. ". Then you can solder the adapter to the board. To improve the ground connection of your socket, it is reasonable to also connect the now defunct rest of the antenna trace to ground. This gives proper grounding to your socket from both sides. " The ground connection is improving the signal? Do you mean connecting like this? Or do you mean soldering like this? Because commercially made ones are too #### expensive. You are about to report the project "CC2531 USB Adapter Antenna mod", please tell us the reason.